It is often difficult to identify the species of tree from which a burl has been taken, particularly in cut and polished examples, but this has the appearance of birch burl (huamu). Birch grew in Manchuria, homeland of the Qing rulers. Burl wood was used frequently in China, and was also used for making the typical shallow tea bowls used in Tibet and Mongolia. The material would have been available to the Chinese throughout the Qing dynasty, and it is difficult to date many surviving examples because they lack decoration, dates, or inscriptions. The majority of burl-wood snuff bottles were probably made from the mid-Qing dynasty onwards, and mainly for a non-Imperial market. 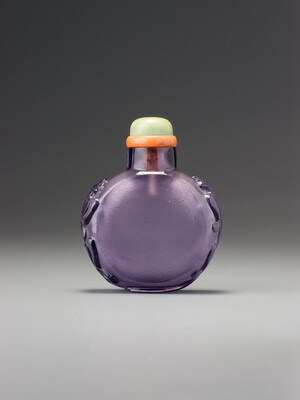 A bottle such as this, however, could date from mid-Qing and have courtly connections. For that period we cannot rule out an Imperial product simply because of its common material. For an impressive example with an ivory neck and loop handles for a cord, see Au Hang 1993, no. 238, where no. 239 is another, of the more typical later-Qing type having prominent mask handles and a matching stopper. For two other burl-wood snuff bottles, see Geng and Zhao, nos. 429 and 430.